Spicy Treats: Bread Veggie Balls / Bread Vegetable Rolls / Bread Croquettes ~ Easy Bread snack recipes! Bread Veggie Balls / Bread Vegetable Rolls / Bread Croquettes ~ Easy Bread snack recipes! I combined the bread slices with few chopped vegetables n spinach, made a dough and deep fried them, to my surprise it turned out so good. This is a very filling and yummy snack loved by all ages. I wanted to stuff the snack with more vegetables so added which ever found inmy friedge, so each one added their flavor and taste :) Rice flour has done its work very well, the bread balls were so crispy and yummy even after cooling it tasted so good but crispness was best when its hot. So try to serve it hot with some spicy chutneys/sauces. I served it with green chutney n ketchup, Both my kids n H loved it. Try this yummy snack and impress your family and guests!! And divide them into 15-17 balls and shape them to balls or cylinders or to desired shapes. Now heat oil in a kadai to deep fry, once the oil gets really hot gently drop balls one by one keep rotating the balls now n then (like u do for gulab jamuns) to ensure even cooking..after adding balls reduce ur heat to medium. once the balls turn golden brown and crisp on all side remove from oil and drain it in paper towel. Befor adding next batch again turn heat to medium high wait for 1-2 minutes then repeat the same process with remaining balls. 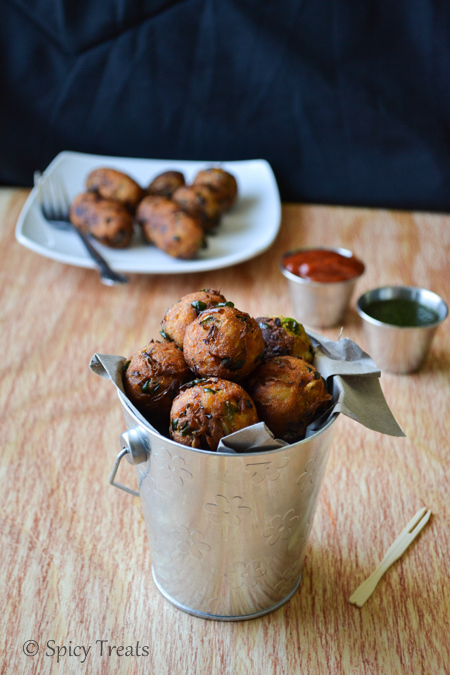 Once done serve the hot & yummy bread veggie balls with green chutney and ketchup. With the same recipe, along with bread n potato u can also use grated paneer/tofu. i used wheat bread u can use any deisred bread. do not add water more than the mentioned quantity then ur bread balls will drink more oil. Make sure that before adding balls ur oil is hot enough, then reduce the heat to medium and fry till done. After that again change it to high and allow to oil to get hot and fry next batch. I also fried the balls in paniyaram pan for a good n low calorie snack, that also tasted good equaly but requires more time. cook covered and in medium heat. If u don't have spinach then omit and add finely chopped cilantro. Add more or less vegetables to your choice or u can make it as plain bread balls with potato n rice flour, spices alone. For addition flavor, u can also add 1/4 tsp garam masala powder. yummy snack!!! Nice n easy way to tuck in veggies for picky eaters!!!! perfect snack and awesome clicks. i just luvd dis...will surely giv it a try !! Amazing pictures Sangee! Couldnt take my eyes off! So much to learn from you girls! Veggie balls look amazing! Too good....... perfect for breakfast,nice clicks. Wow!! !yummy snack,looks so tempting....wonderful clicks. Want to be your neighbor Sangee and come over when you make these!!! beautiful clicks and yummy snack ! Looks super delicious and a very cool. Yummy and mouthwatering bread snack Sangee. Fantastic. Beautiful clicks and perfect snack akka... how are u now? Wat an attractive snacks, those cute balls and rolls are absolutely stunning sangee, just cant take my eyes from ur clicks..Crispy balls are simply awesome. sangeeeeeee akka ennanga ipudi tempt panraaanga..amazing clicks..love it n now am forcing hubby to prepare some snacks after seeing thes epics...totally love them!! First picture is super good sangee. Want to grab the entire plate. Want to know how you included these fonts? any special software used? These bread rolls look divine, and meat free great!!!! Thanks for such a yummy recipe.